As the 1953 season approached, New York’s veteran shortstop, Phil Rizzuto was not enjoying his offseason. Two years removed from his MVP year of 1950, Scooter was getting on in years and slumping at the plate. Yankee GM George Weiss had sent Rizzuto a contract for the ’53 season that included a significant pay cut and to make matters worse, the future Hall of Famer had spent time in the hospital that winter, being treated for some sort of stomach disorder. Observing all this from his home in California, Yankee skipper Casey Stengel was making plans just in case he did not have the services of Rizzuto on Opening Day of that ’53 season. The Ol Perfessor had two young Yankee shortstop prospects attend his baseball school in Glendale that winter. The first was Andy Carey, who was considered number one in line to succeed Scooter. The second was a University of Southern California graduate by the name of Jim Brideweser. Brideweser had put himself into contention for the job with a solid 1951 season with the San Francisco Seals of the Pacific Coast League. Then in 1952, he saw significant action with the parent club as Rizzuto’s backup. When Carey showed up at the Yanks 1953 spring training camp with a sore arm, Stengel told the Yankee press he was going to start Bridweser at short and give him a “thorough trial” that spring. Casey was true to his word and as late as March 22nd of that year, he was still telling anyone who’d listen that he was thrilled with Brideweser’s effort that spring. As the situation played out however, Rizzuto was finally signed and got healthy enough to play 134 games that season and put together a fine bounce-back performance. Carey was switched over to third, where he’d play the rest of his career. 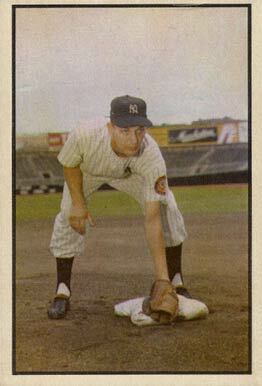 Brideweser started the year on the Opening Day roster but spent most of that ’53 season in Syracuse playing for the Yanks Triple A team there. New York GM George Weiss purchased switch-hitting utility infielder Willy Miranda from the Browns that June and he became Rizzuto’s primary backup. The following May, Brideweser was traded to the Orioles. He would get big league at bats with Baltimore, the White Sox and the Tigers before retiring as a player in 1957 and becoming a high school math teacher and baseball coach. This long-ago Highlander outfielder, this former University of Michigan quarterback and this first great Yankee first baseman were each also born on February 13th. Guy Zinn was the starting right fielder for the 1912 New York Highlanders. He was born in West Virginia in 1887. He played his first game of minor league ball in 1909 and two seasons later, while playing for a B level team in Altoona, PA, he caught the attention of the Highlanders by belting 11 triples, 7 home runs and averaging .317. New York offered him a contract after his Altoona season ended and Zinn made his Major League debut that September, with a nine-game cup-of-coffee trial with the Highlanders. That 1911 New York team that Zinn became part of was in complete disarray. The season before, the Highlanders had looked as if they were becoming one of the junior circuit’s better teams, finishing second to Connie Mack’s mighty A’s. But in a bizarre late-season episode, New York skipper George Stallings had accused first baseman Hal Chase, his team’s biggest star, of throwing games. Unbelievably, the Highlander ownership sided with Chase and fired Stallings. Even more unbelievably, they gave Chase the manager’s job. You can imagine the turmoil this craziness must have caused among the Highlander roster. The team went from 88 wins and a second place finish in 1910 to a 76-win, seventh-place finish in 1911, to a disastrous 50-win, last place, bottom-falling-out debacle in 1912. 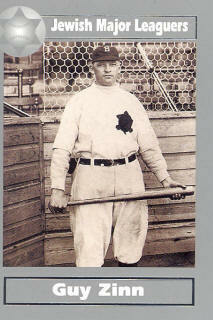 Zinn actually played well for that 1912 Highlander team. He led New York with 6 home runs and finished second in RBIs with 55, while averaging .262. Just 25-years-old at the time, under more normal circumstances, these stats from a rookie outfielder would be good enough to warrant a return invitation. But these were far from normal times. 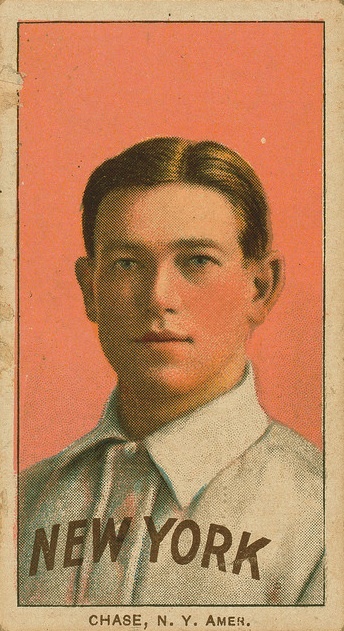 Harry Wolverton had replaced Chase as Highlander manager after the 1911 season, but Chase retained his job as the Highlander starting first baseman. After the last-place finish in 1912, the no-nonsense, two-time World Series winning former Cub manager, Frank Chance was brought in to right the ship. Several player personnel moves were made and one of them was the sale of Zinn’s contract to the Boston Braves. A year later, Zinn jumped to the upstart Federal League. Frank Chance did finally convince New York to dump the corrupt Chase, who himself would join Zinn in the Federal League in 1914. Ironically, Chase also happens to share Zinn’s February 13th birthday as does this former University of Michigan quarterback who also happened to be a Yankee third base prospect and this one-time Yankee shortstop. Imagine if at some time during the 2012 season, Joe Girardi held a press conference after a Yankee defeat to announce to the media that he suspected Mark Teixeira had just purposely played poorly in that game. How would the public react if Girardi went on to accuse Teixeira of throwing the game for gambling reasons? Then try to comprehend Teixeira pleading his case to Hal Steinbrenner, who ends up believing his star first baseman’s story, fires Girardi, and names Teixeira, of all people, to become the next Yankee manager. Unbelievable! Right? Such a course of events involving the current star Yankee first baseman is beyond the realm of imagination of today’s baseball fans. But this is exactly what happened to the very first star first baseman in the franchise’s history. Hal Chase became the regular New York Highlander first baseman in 1905 and remained in that position for a little more than eight seasons and over 1,000 games. “Prince Hal” was a smart and gifted athlete who immediately became a fan favorite in New York. It was Chase who first began the now accepted defensive strategy of charging the plate in likely sacrifice situations. He also pioneered the practice of moving into the outfield to receive and relay cut-off throws. In addition to being an excellent and innovative fielder, Chase was also a strong hitter and a great base runner. He had a .291 lifetime batting average and his 248 stolen bases made him the all-time Yankee base stealer until Willie Randolph and Ricky Henderson passed him seven decades later. Chase, however, had one passion greater than his love for baseball and that was money. Perhaps, if he lived in today’s era of free agency and multi-million dollar contracts, his story and career would have had a different ending. But at the turn of the century, professional baseball players were not paid royally. As a result, many of them were forced to earn a living doing other things. Before the 1908 season, Chase tried holding out on the Yankees, to force team management to pay him more money. Even though the tactic was successful, Chase still jumped to the outlawed California league and played for the San Jose franchise using a fake name. Caught in this charade, Chase was suspended by the Highlanders but his immense popularity with New York fans quickly got him reinstated. It was after this episode that Chase’s reputation as an unsavory character began to emerge. His manager, George Stallings, began to suspect Chase of throwing games. The skipper’s suspicions grew so strong during the 1910 season, he leveled the charges publicly. But Chase’s popularity on the field helped him earn enough support with Yankee President Frank Farrell and League President Ban Johnson to beat back Stallings’ charges and actually get the manager fired. Adding insult to injury, Chase got himself named to replace Stallings as the team’s field boss. Chase was not a good manager and his continued unpredictable behavior on the playing field led to the resurfacing of attacks on Chase’s integrity as a ballplayer. By 1913, even the Yankee brass became convinced Chase could not be trusted and they shipped him to the White Sox, where in 1914, Chase chased the money again and jumped to the Buffalo team entry in the upstart Federal League. The smaller than normal confines of the Buffalo home field helped Chase accumulate 17 home runs during the 1915 season, so that when the league folded after that season, the Cincinnati Reds welcomed him to the National League with wide open arms. Even though Chase won the National League batting title with a .339 average in 1916, the Reds skipper, Hall-of-Famer Christy Matthewson, felt the first baseman was involved in throwing games and promptly suspended him. This time the team ownership and league officers backed the Manager instead of Chase and upheld his suspension. The next year was the year of the Black Sox scandal effectively destroying any chance a player with Chase’s shady reputation would ever have of playing Major League Baseball, again. Hal Chase’s story is a sad one, but only three other Yankee first sackers had more hits or more runs scored as a Yankee than Chase did. The fact of the matter is that if Hal Chase had not gotten himself accused of throwing baseball games, his career with New York would have been longer and his numbers and stature as a Bomber, even more impressive. This former Yankee, also born on this date, once quarterbacked the Michigan Wolverines to a Big Ten title and a Citrus Bowl victory over Auburn. This former teammate of Chase’s and this one-time Yankee shortstop were also born on February 13. Drew Henson first became part of the Yankee organization in the third round of the 1998 MLB Amateur Draft. Even though the high school football star quarterback had already announced he would attend and play football at Michigan, the Yankees drafted him in the third round that year, gave him $2 million and hoped for the best. Henson spent the next two football seasons mostly sitting on the Wolverine bench watching starter Tom Brady throw all the passes. He got his chance to replace Brady his junior year. As the team’s starting QB in 2000, Henson led Michigan to a Big Ten title and a victory over Auburn in that season’s Citrus Bowl. He threw 18 touchdown passes that year and just 4 interceptions. He had proved he could lead a big-time college football team successfully, but he would forsake his senior year in Ann Arbor to prove he could play big league baseball as well. While he had spent his last three falls playing football, Henson was spending his summers advancing up the rungs of the Yankees’ Minor League farm system. Problem was, his play was really not good enough to climb those rungs. His biggest problem seemed to be pitch selection at the plate. He struck out way too much and hardly ever walked. He had OK power but not enough to make up for all those whiffs. That’s probably the biggest reason why New York included Henson in the four-player package of prospects they used to acquire starting pitcher Denny Neagle from the Reds right around the 2000 All Star break. He did no better during his 18-game career in the Reds’ farm system and ended up back in pinstripes when New York reacquired Drew in exchange for Willy Mo Pena during the final weeks of the 2001 spring training season. New York’s front office got him back because they were convinced if Henson concentrated only on baseball he would become the Yankees’ next starting third baseman. That explains why the team gave him a six-year, $17 million contract upon his return from the Reds. Henson accomplished two things on the baseball field during the next year and a half. He got his first Major League at bats in pinstripes, going 1-9, and after collecting about ten million Yankee dollars, he convinced himself that he would be better off trying to become an NFL quarterback and not the Yankees’ next third baseman. Another Yankee born on today’s date was once accused of throwing baseball games by his own Manager. You won’t believe what happened next. Find out here. This long-ago Highlander outfielder and this one-time Yankee shortstop were also born on February 13th.